Once we start moving there is no doubt at all that Isabel is in charge – completely in charge. She’s absolutely the captain of her crew and quite a demanding taskmaster. She knows exactly what she wants, but she goes about getting it in a very quiet, good-natured way. She’s always smiling, always friendly (but never too friendly – there’s a finely-judged distance between her and the crew). At the same time she’s very firm and makes absolutely sure that everything is done exactly as she wants it. I was very impressed by her effectiveness in getting her team to work for her: they seemed to go beyond the call of duty in doing what she wants. The work of surveying is exactly like factory work, a precisely defined synchronization of time and motion. The succession of observers moves through the boat much like a production line; the data produced at the end is the final product, and every slice of time produces perforce a certain amount of data. This being so, you’d expect a certain amount of resistance; you’d expect the people on the line to try and find a few shortcuts. But they don’t seem to. For instance, while on binocular watch some of the observers take care to stand, even though this is quite strenuous. Nor did it seem to me that they were trying to cut any corners, even though the days are very long – extending from 6 a.m. to 7 p.m. in many cases. But Isabel isn’t entirely happy with their effort I think – I suspect she thinks they could try harder to spot dolphins. But of course the odd thing is that the way a survey like this is designed it doesn’t matter whether an observer tries or not; what matters is that they go through the motions. It’s all data either way. 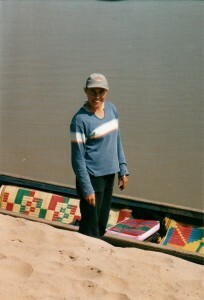 Most women field biologists, Isabel says, take it more or less for granted that they will not marry or have children or indeed, any kind of domestic life (although there are a few exceptions, like her own research supervisor, Prof. Helene Marsh). Isabel was once on a dolphin surveying expedition in the Pacific, and the majority of the scientists were women, in the 30-35 age-group. Almost none were married; very few even had serious relationships. ‘Women know they can’t have careers (in field biology) as well as families.’ No one would give contracts to people who would have to absent themselves regularly in order to be with their families. Equally, if a woman took two or three years off she would find it very hard to come back into the field. For one thing she would have fallen behind in her network of contacts; for another younger people would have come along and squeezed her out. In a way it’s a very competitive field – like any other, investment banking, publishing, whatever. ‘But I don’t know,’ said Isabel, ‘how I’ll feel when my biological clock starts running out.’ To me it seems very ironic thhat field biologists should lead lives that are so completely at odds with the biology of their own species. Does there still exist, I asked, a group scientists who would describe themselves as ‘naturalists’? A few, she said. She named one whose knowledge of the natural world of South-East Asia is so detailed and thorough that people refer to him as a ‘naturalist’ – but his specialization is birds. Then there was another man, who is in North Korea. He’s been lucky to be allowed to study birds in North Korea, but he’s always followed by watchers. He has no friends, no visitors, and that’s how he likes it – visitors would be a distraction. I asked Isabel if she knew about trees and she shook her head ruefully; no, she doesn’t and doesn’t particularly want to. ‘Just want to keep what I’ve got in my head’. On another occasion she told me that she couldn’t conceive of doing terrestrial zoology because she hates insects and mud. In watching Isabel administer this survey, it occurs to me often that this procedure and everything it entails, is exactly the opposite of what it means to study literature. There we study the human mind in the moments when it achieves its peaks of creativity; this process is the opposite: it is to study the absence of excitation; the absence of disturbance; even ‘behaviour’, which might afford some interest, is meticulously excluded. It is as though you were to try to understand a book not by reading it but by watching the writer write. What does it mean to love this work and to want to do it so much as to give up so many of life’s rewards? When I ask Isabel this she says, first: it’s about the animals and the connection you feel with them (but this, she acknowledges, is a small part of it as the animals are seen only for brief moments; in any case only a few of them are even recognizable as individuals); secondly it’s the feeling that you’re making a difference in a certain way; helping to conserve a species and in that way contributing to the fate of the earth. The third is simply that she likes to be ‘out and about’; a 9-5 office job would not suit her at all. I pointed out that her work was, if not 9-5 exactly, then certainly ‘work’ in the sense that it is built on counting units of time. To this she replied: ‘But it’s outdoors; out in the open.’ This last part is very important to her; it comes naturally. Growing up in New Zealand she loved water-sports – surfing, water-skiing and so on. All these activities come naturally to her. Of her three siblings, two took to cars right away but she and another took to the water and just loved it. Yesterday I took three turns as Principal Observer. 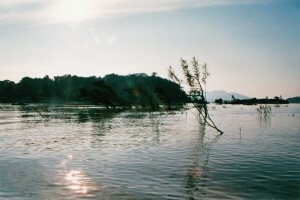 What it consists of is this: for the first half hour, the Observer is equipped with binoculars; either standing or sitting (on the camera case) he or she scans the water ahead, turning a regular 180 degrees from left to right; his/her magnified gaze sweeping the river, as it were, like the beam of a lighthouse. The second observer sits in front, watching the same field of vision with the naked eye; he too swivels his head as he sits, turning from one side to another at regular intervals. The idea is that even if something is missed by the observer with the binoculars, the naked-eye observer will pick it up. The binoculars have to be of a specification (70 x 50 ?) and they have to have a compass embedded in the eyepiece. Whenever an animal is sighted, the observer with the binoculars is required to take a compass reading of its location in relation to the direction in which the boat is headed. 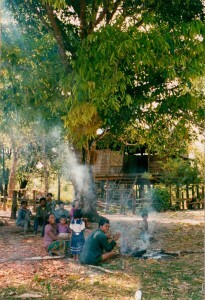 Earlier in the day we stopped at another small place – just a single hut surrounded by breadfruit and cassava plants – and found a forty-ish man sitting there. Isabel went up to the man’s hut and asked, through Mr Somany, if he had seen any dolphins in the area. No, the man said, he hadn’t seen any, but then he hadn’t been there very long. It was just a short while, he explained, since he had left the Khmer Rouge. 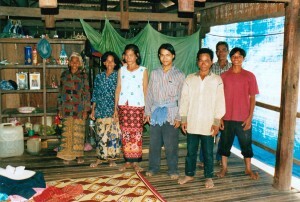 For a long time he had been a soldier in the Khmer Rouge army and had only recently got out. We bought some cucumbers from him. After lunch I told Isabel that I’d like to go on to the place where we were going to spend the night as I’d like to get on with my notes. She seemed relieved to hear this – maybe she’s had enough of my trailing her about – and suggested I leave straight away. This is what I decided to do. 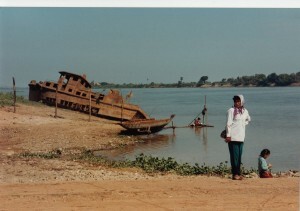 We went on for some 15 minutes or so and arrived at a small settlement on the banks of the Mekong, a slightly more prosperous village than the last, which seemed very dilapidated indeed. 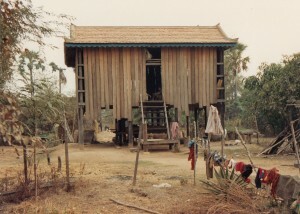 Mr Bann led me to the hut where we were to stay – a long-house built on stilts. As I write now, I am surrounded by members of the family who are whispering to each other as they look at this notebook over my shoulder, ‘Anglais’, ‘Anglais’. The rapids extended over a mile and we are now past them, back on open water. 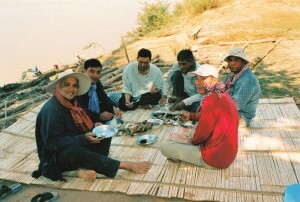 Soon after that we stopped for lunch, at a fishing village – where they’d just caught some river fish which (Mr. Somany said) were a great delicacy. 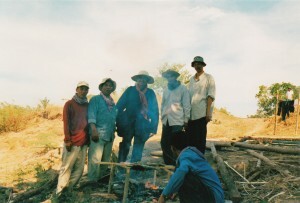 We climbed up the banks into the village, and the villagers lit a fire on which our team roasted several fish. This, along with the packets of food we’d brought from Kratie, was our lunch. Isabel – who doesn’t eat much apart from instant noodles and Ovaltine (anything from a packet) – looked quite sick and went away for a walk. But Mr. Seng Kim, Mr. Somany and I talked about many things. After lunch, Isabel went to interview the old man of the village, taking Mr. Somany along to translate. I tagged along. The old man was small and bandy-legged, with a face as wizened as a walnut. He said that in the past there were dolphins a long way up the river, but the numbers have steadily fallen. His feeling was that fishing with bombs and ‘elastic fishing’ were principally responsible for the decline. Vietnamese soldiers, in the 1979-80 period, he said, were responsible for killing a lot of fish and dolphins with bombs. Before that American bombs had also taken a heavy toll (several other villages said that American B-52s had bombed that area heavily during the war). He also said that though dolphins were never seen in his area now, he remembered seeing them when the Japanese were in the village (during the Second World War). At that time, he said, otters and elephants were also seen in these parts – but these too had not been seen there for a very long time. 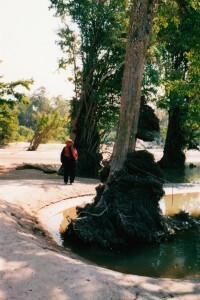 During the ‘Pol Pot regime’ he said, he had been sent to live in Sombok. Why? He couldn’t really think of an answer. We’re setting out in two boats this morning. This is the beginning of the expedition properly speaking. 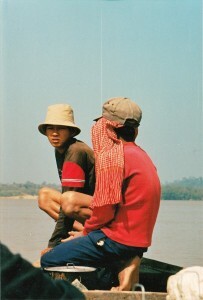 Now we head straight up to the Laos border and won’t return to Kratie till the middle of next week. 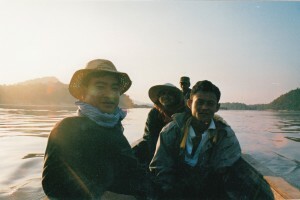 From Kratie to Sombok we will take taxis – the boats have trouble on this stretch of the river because of the rapids. 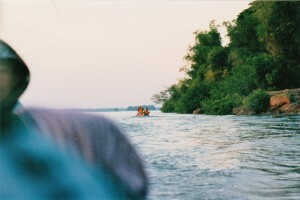 Although they can negotiate the rapids it is slow going and takes 3 hours or so. By taxi it takes only an hour. 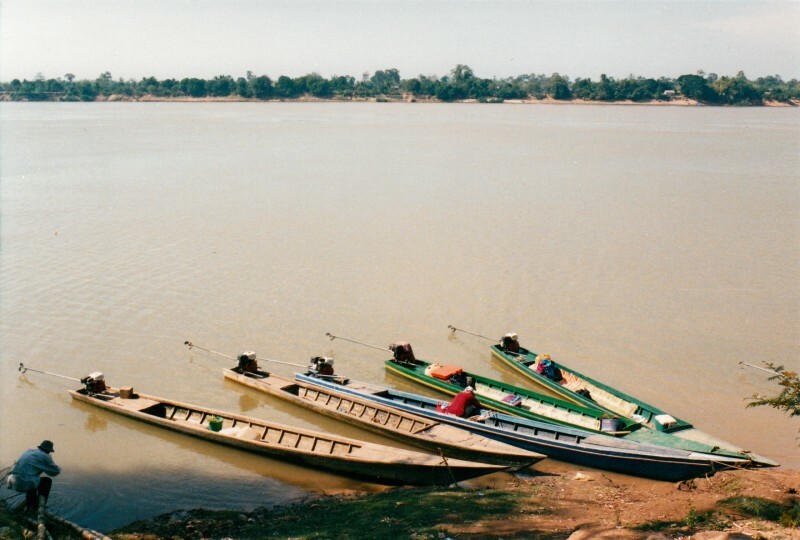 At Sombok by arrangement there are boats waiting. 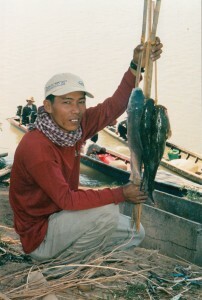 The boatman is a Mr. San, a tall man, with very high cheekbones; he looks distinctly Vietnamese. Yesterday Mr. San drove the boat that Isabel and I were in, along with two other, one Mr. Seng Kim and another man. 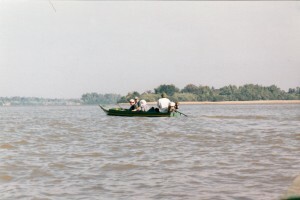 Mr. San’s brother drove a second boat, with an accompanying party. 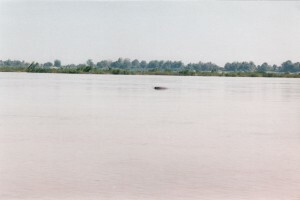 We spotted dolphins very soon after we left Sombok – apparently there is a spot near the village that is frequently visited by dolphins at this time of year. It isn’t a recognized pool as such, but rather a place that they migrate to at certain times. In fact, I was the one who made the first sighting: I was initially hesitant to alert Isabel – who was on binocular watch – because I thought it might be against the protocol. But Isabel said the we were on ‘direct observation’ at that time and anyone could make the call, as and when a dolphin is spotted. We saw about three dolphins at that spot and then moved on – or rather back – because the idea was to pick up the survey exactly where the course (as charted by the GPS) had been interrupted the day before. This is possible because the map from the day before can be called up on the GPS device and the current position of the boat can be mapped on it. You can actually watch yourself moving on the little screen as you intercept the course. Yesterday, in the boat, Isabel commented that among zoologists there are many who don’t take cetologists seriously: ‘how can you work on dolphins?’ She attributes this in large part to the baneful influence of one Ellis [perhaps Richard Ellis, author of ‘Imagining Atlantis’ etc.] who writes sham-spiritual books about dolphins and whales. But the dolphin-healing movements etc are also to blame. She said that with some kinds of whales if you happen to be swimming above them, you can actually feel their echolocation beeps passing through your body. The frequencies are so low that they enter your body and seem to go right into you. And there can’t be any doubt that cetaceans do use echolocation to explore human bodies. Dolphins will often gather around a pregnant woman, singling her out in a group, prodding her with their noses and so on. This has often been observed. Isabel hopes to do these surveys continuously over a year. After that she will have a complete and fairly exhaustive record of where the dolphins live and where and how this is connected to changes in the seasons etc. She’s concerned for example that she’s missing some animals in the Jan, Feb, March period. At this time dolphins are still moving outside the deepwater pools. She can tell that many of them are away, because a comparison of sighting-numbers and estimates shows that a number of them are missing and unaccounted for at this time. She simply does not know where they are – they could be ranging quite far afield or they could be just on the outskirts of the pools. There is no clear way of determining this. I suggested that they might be in the tributaries but she explained that this wasn’t possible as the water is too low. Accounting for these unaccounted animals might well be one of the major contributions of her thesis. Another contribution will be in resolving the question of why dolphins choose some pools and not others as favoured habitats. There are literally hundreds of deep water habitats that are not used by the dolphins. Her feeling is that the dimensions of the pools make a difference – depth certainly does because they don’t like pools that are too deep. The depth has to be just right. 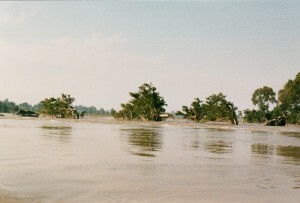 But the connection between the pools and the main channel of the river also makes a difference: they prefer pools that are not too isolated; there have to be easy connections to other similar pools. 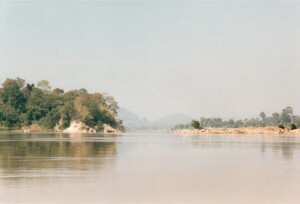 The pools at Kampi and Chray Banteay are a good example of this – they are on two different sides of the river, but there are channels connecting them, so the dolphins can move back and forth. The topography might also make a difference. She has a feeling that they like gentle, curving slopes – not steep channels. When she gets back to write up she intends to spend a lot of time figuring out the geomorphology of the river pools. At the moment her work focuses on three things: one is Abundance (determining the numbers); the second is distribution (habitat preferences); the third is critical habitats. The third aspect is particularly important to the conservation aspect of her work – and this is very important to her; all her zoological work has a conservation aspect to it. I asked Isabel: What would you do if you were to make a field trip to the Sundarbans to study the Gangetic dolphin? Her answer was that she would first do a preliminary survey. For this she would hire a local boat. What kind of boat? I asked. Ideally, she said, she would like a boat that provided a raised viewing platform. 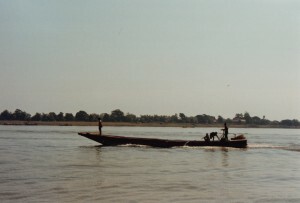 I asked why she hadn’t got a boat of that kind for this survey and she said it wouldn’t have been possible because big boats couldn’t negotiate the Mekong’s rapids and would certainly not be able to make it all the way to Stung Treng. It struck me that a similar issue would arise in the Sundarbans, for a big boat wouldn’t be able to make it into the smaller creeks. However she added that platform height was not an important factor in direct counts (like that which she’d do in the Sundarbans). The important thing was to keep the same platform height throughout. The next thing she’d do is conduct interviews with local people, in order to get an idea of distribution, habitat preferences etc. After that she would design a survey to suit the local conditions. The whole point of the survey is to create very highly standardized measurements and recordings. In ‘On Effort’ periods, in Isabel’s survey, there are 2 observers on duty for 30 minutes, One is in the prow of the boat, looking through binoculars, covering a 180 degree view. The other observer in the meanwhile, is observing with the naked eye and he/she sits aft. The observers are both usually seated, although they can stand if they want to. The observers change position with other observers every 30 minutes, working in groups of two. Isabel says that is she had a different kind of boat she would have liked to have an observer in the stern as well. 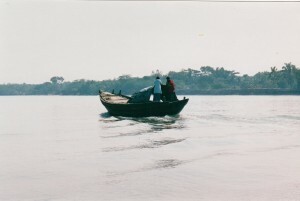 This is a lesson learnt from surveys of the Inya – the Amazon dolphin – which tends to sound at the approach of a boat and surfaces well behind (and are thus often missed). Also one observer at the stern of the boat also provides some sense of the number of animals being missed by the others. Observers who are On Duty are called Primary Observers and those who’re off-duty are called Independent Observers. If observers who are resting make a sighting that has been missed by the Primary Observers, then those have to be attributed to the Independent Observers. In a large boat, with more personnel, Isabel would have arranged the observers differently. There would be three observers in the bows, one looking left, one right and one directly ahead. The left and right observers would be armed with binoculars, while the forward looking observer would be watching with the naked eye. The speed of the boat is ideally between 8 to 10 kmph. The effort sheet also records many other things: the direction of travel, depth, turbidity, habitat-type, state of the river etc. All these are recorded every time there is a change of observer – in other words ever 30 minutes. If a dolphin should happen to be sighted, that results in an E.E. – ‘End of Effort’. After that a data sheet has to be filled in, recording the details of the sighting. These protocols, as Isabel uses them, are based largely on the methodologies that she learnt while working on coastal surveys in Hong Kong. But they also draw on a paper on surveying methodology for river dolphins that was published in 2000 by two Australian cetologists. 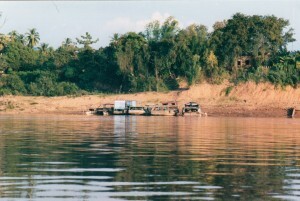 The recording of the boats’ track is done only while On-Effort. After a spotting the GPS is switched off and is turned on again only when the effort resumes. 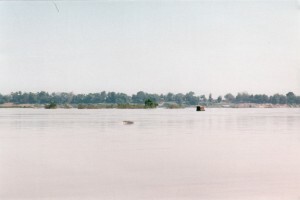 Turbidity is recorded through Secchi Disk readings. This is a marked disk that is dipped in the water. The point at which the markings cannot be read is the measure of the turbidity. Water temperature is recorded with a simple thermometer, of the kind used in domestic aquariums. One of the useful tools is a software package called Geographic Information Systems. It allows many different kinds of information to be mapped on to a topographical map. Thus, turbidity, depth & sightings can all be mapped on to a chart of the river, providing instant visual confirmation of co-relations between these different factors.